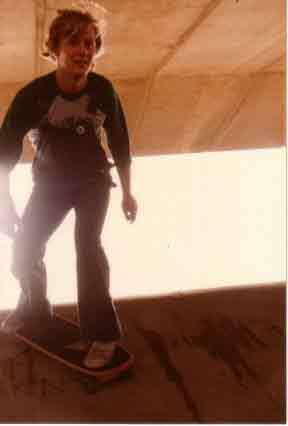 In the 1970s my mate and I learnt to skateboard in a strange little snake run at the Harrow Club in Frestonia, next to the A40(M) Westway spur to Shepherd’s Bush. We’d spend evening after evening there getting to grips with the concrete, before buying better boards and moving on to what’s generally known as Meanwhile 2, under the Westway, and the warehouse delights of Rolling Thunder, now the swimming pool and sports centre near Chiswick roundabout. There were motorbike trips to Romford and Harrow skateparks, too, and of course to the bowels of the South Bank. Now, of course, the South Bank Undercroft and Romford skatepark are protected areas (no, not Areas of Outstanding Beauty: Romford is a Grade II listed site, the Underrcoft has been saved from yuppiefication and redevelopment) and skateboarding is an Olympic sport (although I seem to remember it almost being one of those before). After years of fag-wielding kids hanging around in streets and car parks doing ‘tricks’, a new generation of concrete bowls, pools and ramps has emerged around the country, and skateboarding is suddenly hip again. I’m too old to skateboard any more, although my snub-nosed Lonnie Toft deck with its Bones wheels and Indy trucks are still in the garage, and I sometimes kick round the close, but I was delighted to see that skateboarding photography is finally being taken seriously, and that Against the Grain is happening in Soho this month. The exhibition contains work by 11 photographers and 4 film-makers, and is a fascinating mix of old and new photos, including some iconic images previously published in various skateboard magazines. It’s a strange and compelling mix of Californian sunshine and backyard pools, urban grime and grit, excitement and the mundane. As part of the event there’s also ‘Palace to Palace’, six installations of photographs at six South London skateparks showcasing the sites over the last decade. 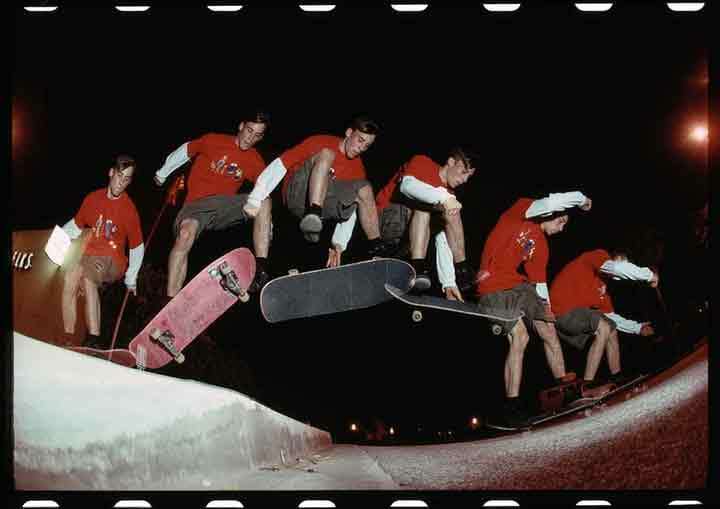 This isn’t all about macho stunts and grabbing air (although there is plenty of this to be seen), nor about accidents and faceplants; it serves a serious documentary purpose and shows just how good skateboard photography is and always has been. J. 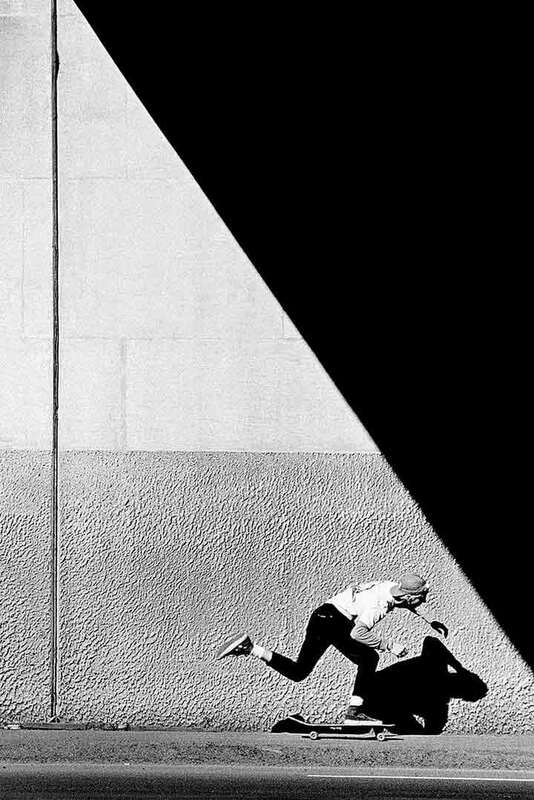 Grant Brittain’s ‘Tod Swank, Push, 1987’ is a glorious black and white abstract wall with bold shadows and detail backgrounding Swank’s hunched-up body as he scoots along the street, whilst Skin Phillips captures a bemused and intrigued old lady reading a skate mag in ‘Grandma, Thrasher, Swansea, 1984’. Elsewhere there is time lapse to detail a winning trick, moments of relief, aggression and stupidity, the excitement of crowded competitions, as well as contemplative solo sidewalk surfing. It’s a great exhibition, even if it doesn’t document that little snake run I started on. It didn’t make it into Trawler’s Snakes and Moguls. A scrapbook of Britain’s seventies concrete skateparks either, but I live in hope that someone else will remember it and have some photos. It happened recently with reference to the record shop I remembered being in the back room of a greengrocer’s in Harrow: suddenly there were mentions of it on a website about obscure record shops. My kids have to believe me now! Anyway, forget about that, go see the exhibition: relive your youth or find out about your sport’s history.